What is more adorable than a holiday gingerbread cookie? A pup wearing an outfit with a holiday gingerbread cookie on it! 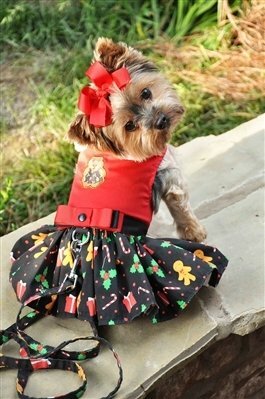 The Gingerbread Dog Dress and matching Dog Harness are sure to be the hot item for this holiday season! Get them while they last! Just like fresh cookies out of the oven, everyone will be grabbing these up while they're hot!